With the F1 news being thin on the ground today and nothing in particular from history occurring to me, I am free to reflect on the events of yesterday. It did not reach the headlines nor trouble the F1 bloggers to put finger to keyboard but, in its way, it was a day as important to the sport as any this year, rubbing shoulders with the WMSC hearing and the movable floor controversy, the customer car issue and Max's opinion of Jackie Stewart. One of my commenters, the esteemed Number 38, and I met for the first time for a drink and a bit of a natter, as they say in England. Now, that may appear a very minor event indeed but it is representative of the international fellowship of motor sport fans, the bedrock upon which F1 and other formulae are built and without which racing would be a matter of boy racers avoiding the police to pit their souped up family runabouts against each other on back roads and disused airports. There is nothing that unites the F1 fan so much as the opportunity to relive great races and share opinions on anything remotely connected with the sport. Number 38 arrived armed with several photo albums containing a history in motor sport stretching back to the sixties. And we went through the lot, fifty years discussed in a couple of hours over a beer or two and a couple of crab cakes. I don't think Max was mentioned once, which perhaps shows his relative importance in the greater scheme of motor sport everywhere. At heart, the sport is about drivers and machines, and politics has nothing to do with it. Its soul remains with the fans and the drivers, the mechanics and engineers, who create the multitude of events every weekend and then argue the merits of F1 in the pub afterwards. As long as this continues, Max's capacity to do damage is limited only to the most visible form of motor racing, the "pinnacle" of the sport. Let us not forget that pinnacles are merely tips, and tips remind us of icebergs. And Number 38? He is nothing like I had imagined him, presuming from his use of capitals and exclamation points a character rather more belligerent than the reality. Roy, for that is his name, is a soft-spoken New Englander, living now in Virginia, and his passion for the sport is what produces the writing style, rather than any irascibility of temperament. He has built and restored cars beyond number, tuned them and raced them, known some of the great names of the past and understands the sport from the ground up. Those battered hands, deep-grained with engine oil yet delicate in their turning of the pages, are evidence of a life lived for cars and motors, the photos themselves a re-awakening of memory for myself, taking me back to the days when I hung around the pits to ogle the cars in events long forgotten now. It was a thoroughly enjoyable time and one of probably many thousands of similar events that took place worldwide yesterday. It did not matter that we were of different nationalities, from different backgrounds and experience - motor sport united us. And this is what really matters, isn't it? I agree that it is the fans that truly keep this sport together. We have a passion for the sport - machine and man. no other sport has this unique meld of a love of machine with or without the man. We tend to think that the piece of metal before our eyes actually has a personality. Some of us name our own cars ( I think most of the F1 fans do) we speak of races past with reverence. Racing is such a part of our lives. Any time you can have a conversation with a fellow F1 fan, time goes by so quickly. We have so much to say and no time to say it. We are also very interested in others opinions. I value a good race conversation and where I live most of them happen on line. Sad but true racing (especially F1) is not very big in South Jersey. This is why I really hate the off season. I know that the teams need to retool and rest but I miss Sunday evenings at the computer reading and writing. If any true race fan goes to Atlantic City drop me a note and I will gladly drive up there and meet to discuss any thing F1. Agreed, Neil - F1 has the best supporters! John, you show the outstanding quality of American F1 fans - they are knowledgeable, articulate and passionate about racing. Combine that with the natural hospitality and openness of Americans and you have a very special group of people indeed! I would love to meet some of the people I talk to about Formula 1 on the internet. Unfortunately, it looks like I will have to wait until I'm a bit richer before I can do that. The Formula 1 and wider motor sport communities are quite special, really, because the people in them combine an incredible passion with good sense and a desire to listen to others. Somehow, Clive, it didn't surprise me that when you and Number 38 you were as happy as could be discussing your shared passion. I guess it was inevitable, Alianora - two old dinosaurs talking of memories and long forgotten triumphs. We were bound to get on well! Too fun! I thought he must have a history like this, the guy reads like old school-- and I mean that with the mostest, bestest respect. I think I recall him mentioning somewhere that he still races. 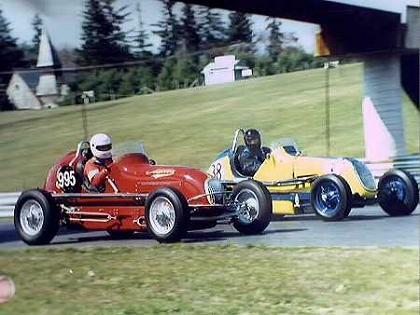 Gorgeous cars, real open wheel and safety was ummm a leather helmet and maybe a pair of gloves in the day. What a long strange trip. Hmmm. It just occurred to me, I never see any links to vintage race blogs on any sites. Any good ones out there? Roy still races gokarts, Verasaki - and shows the young bloods a clean pair of heels in doing so, I have no doubt! His is a life lived for motor sport. I don't know about vintage racing blogs, as such, but if you're interested in conventional sites, Vintage Racing has long lists of them. "two old dinosaurs" !!! Hey Clive may I remind you Michael Schumacher just joined our club, afterall most deemed him "too old". One thought just slipped into my mind. How about if we all, or most of us, just made a promise to get to see the Sep 7 - Spa-Francorchamps, Belgium race. We could all walk aroud there, having homemade signs on our back saying F1 Insight, and our blog-signs, so that we would know that the person in fron really was one of our buddies from the internet. Sounds really fun to me, and the travel should not be to tough to the most of us. At least not me, who lives in sweden, and Alianora should also be able to get there, just taking the train through the tunnel. I really would like to meat up with as many as possible, and talk motorsport all night over a couple of beers. That's a wonderful idea, Björn, and I love the choice of venue - always wanted to see Spa. Unfortunately, it's way beyond my means at the moment and I doubt that will have changed much by the time of the Belgian GP next year. Sooner or later all my irons in the fire are bound to pay off, however, and then it becomes possible - we shall see! Any one else up for the meating?? Im in if there are anyone more coming. I have been waiting for the right motivation for years, and this might be it. That sounds like a great idea, Clive. I'll see if I can save up the money to go. I'll be there disguised as a pit worker, I just haven't decided which team I can infiltrate. My background is the Lotus 79. Maybe I can play the bloke that measures fuel temp!